It’s easy to see why Restwood Motel enjoys so much repeat business. For starters, the motel has been family owned for over 40 years. Rich and his wife, who live right on the property, maintain a family-type atmosphere that emphasizes convenience, simplicity, and friendly, familiar service. 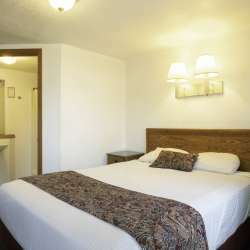 The rooms are clean, comfortable, and have all the important amenities. Rich is quick to point out that they triple sheet all the beds to ensure a fresh, comfortable feel for every guest. The motel also offers freestanding cabins for people wanting a little more “personal space”. 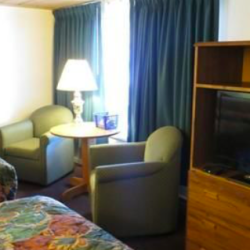 While there’s no set-in-stone cookie guarantee, guests will definitely enjoy a relaxed, comfortable, and memorable stay at Restwood Motel. They’ll feel good knowing their vehicle, especially if it’s a big hawg, is always clearly in sight.